Wow! This lipstick well outperformed its measly $5 pricetag. 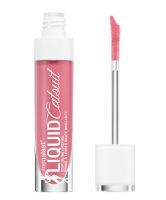 The applicator's shaped like a Barbie foot, which perfectly hugs the contour of my bottom lip, making for precise application. Though it goes on a touch sticky, it dries fairly quickly to a pretty matte, velvety finish. And then there's the stay power. This stuff lasts all. day. long. We're talking from coffee through lunch, dinner, cocktails and beyond. Considering the price point, this is a hella good lipstick. The applicator has an- L-shaped notch taken out of it so that it rests on the edge of your lip just so, letting you draw an ultra-precise, foolproof line. Seriously -- why aren't they all designed this way? For that innovation alone, I'm starry-eyed. Second, this dries down to a beautiful, comfortable matte finish that isn't at all drying...read more. The staying power is impressive too. The only thing I don't like about this lipstick is the slight tackiness to it. Your lips definitely stick together a bit when you press them together. Oh, another selling point: it comes off easily with a makeup remover wipe. Boy oh boy does this have staying power. It has a gorgeous matte finish that doesn't require touch ups. It locks in all day, even through food and drink. The red shade I chose, was so pretty and looked to be pretty universally flattering. The only drawback was it left my lips feeling very dry.